More rain was pretty much the story for the start of our ride. It was cold when we left camp. The temperature was about 8 degrees but when riding the windchill was probably about +3. 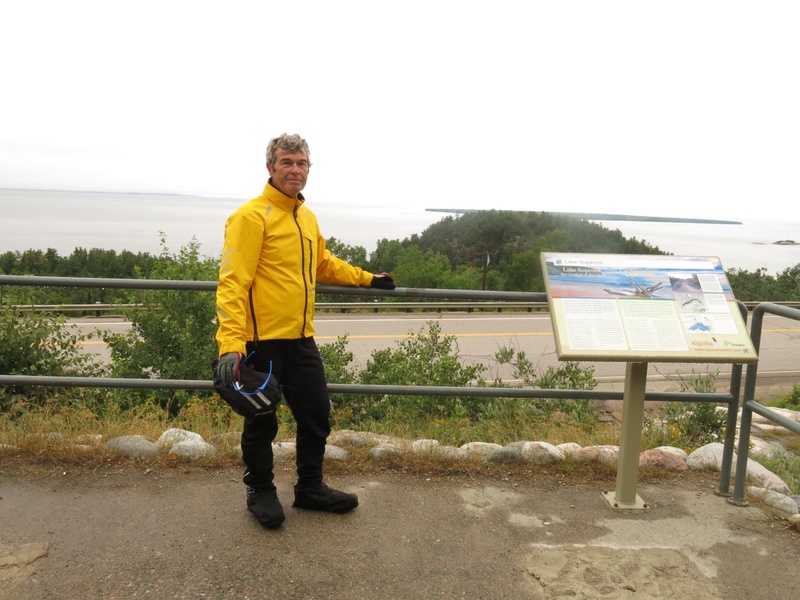 Our first stop was the Agowa Bay lookout which had a great view out over Lake Superior. A few kilometres further was the Agowa Visitors Center. Agowa is the region of Ontario where Lake Superior and Lake Huron meet. At the Visitors Center we were able to buy a coffee and, joy of joys, access WiFi for the first time in days! I caught up on some emails and Facebook while eating a sandwich and enjoying a nice hot coffee. While inside the weather outside was improving. By the time we left the Visitors Center the rain had stopped and it had even warmed up a degree or too. The 3 km descent to Montreal River was quite exhilarating and I was glad I wasn’t riding up that hill. Past the river there was a hill that we had to ride up but wasn’t as bad as the one we had just come down. At the top was a little store where we stopped for some drinks and a sandwich. We were now about 2/3’s of the way through our ride. The weather continued to improve for the last 40 km. about 30 km or so before our destination we started to see signs advertising a gas station, store, craft shop and wood carving store. It appeared to be right near our campsite. I sure hope it’s not closed like so many other places we have passed I commented to Elaine. 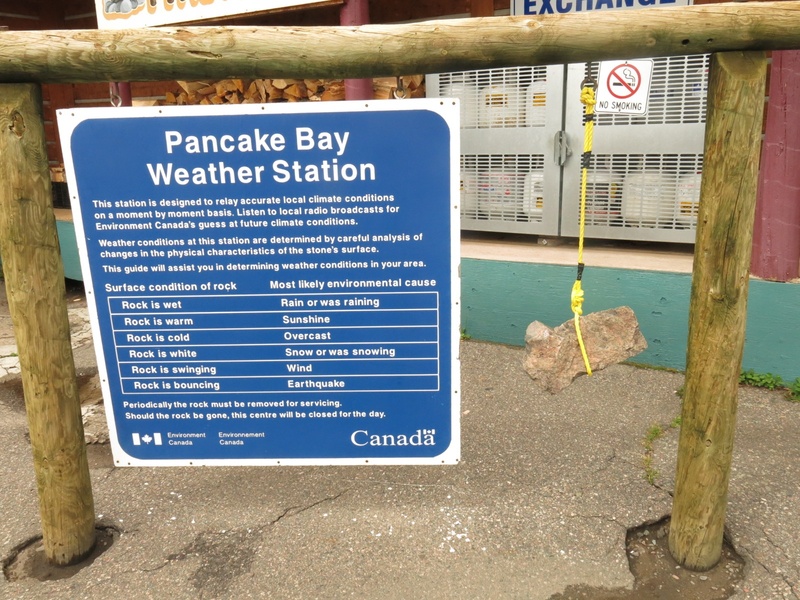 The “tourist trap” was indeed open, teeming with visitors, and just half a kilometre past the entrance to our campground. Even better, they had multiple flavors of hard ICE CREAM!! Several other riders arrived shortly after we did. 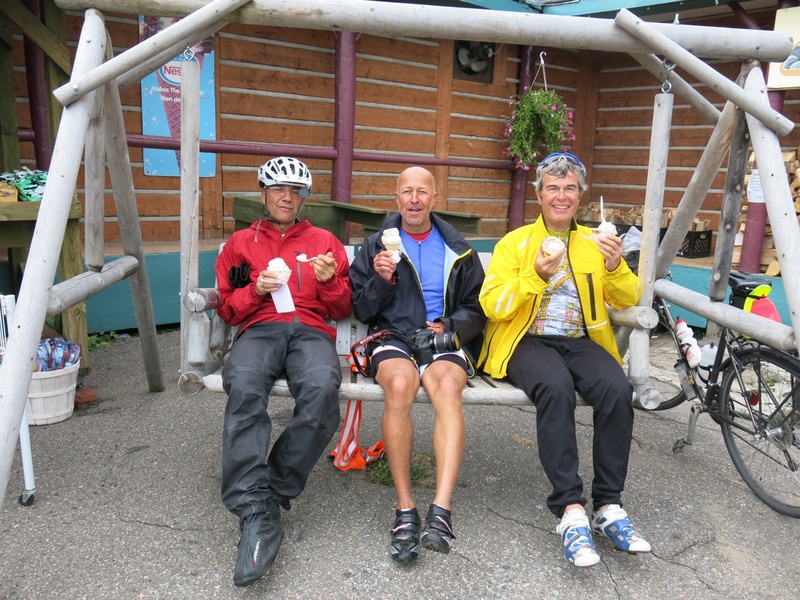 As I sat on the swing with Jacques and Danny, eating my ice cream, we could see blue sky starting to appear above. 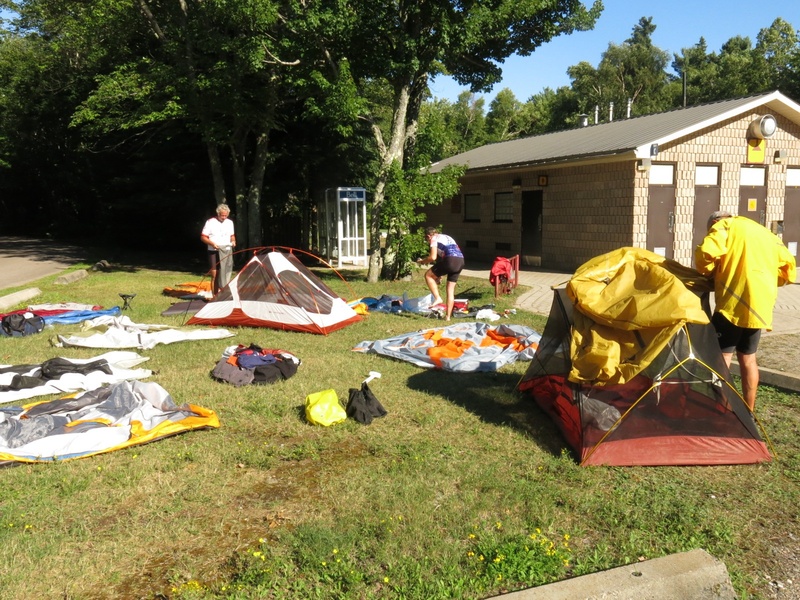 By the time we got to the Pancake Bay campground the sun was out and it was getting warm. The sun was just the medicine our group needed. 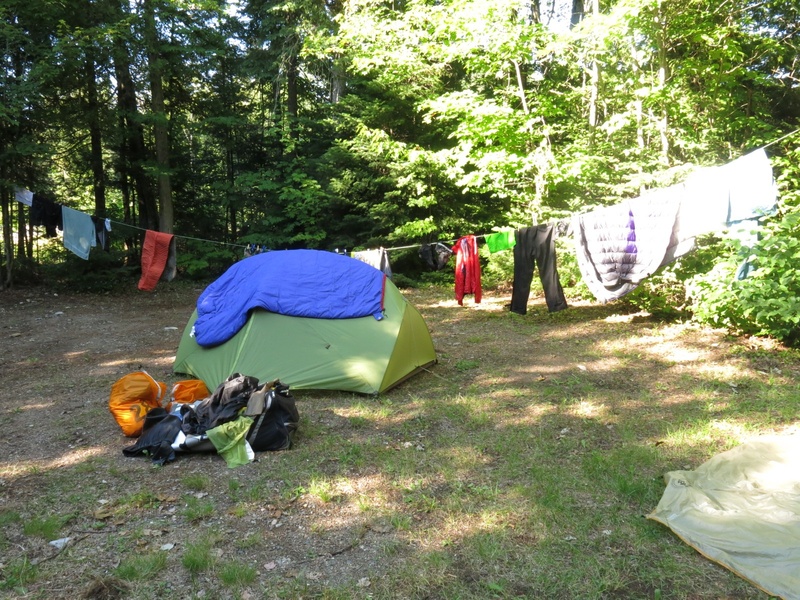 Not only did it lift our spirits but it allowed us to dry out our stuff. By dinner time everyone was in a good mood. Our ride today was 121 km. 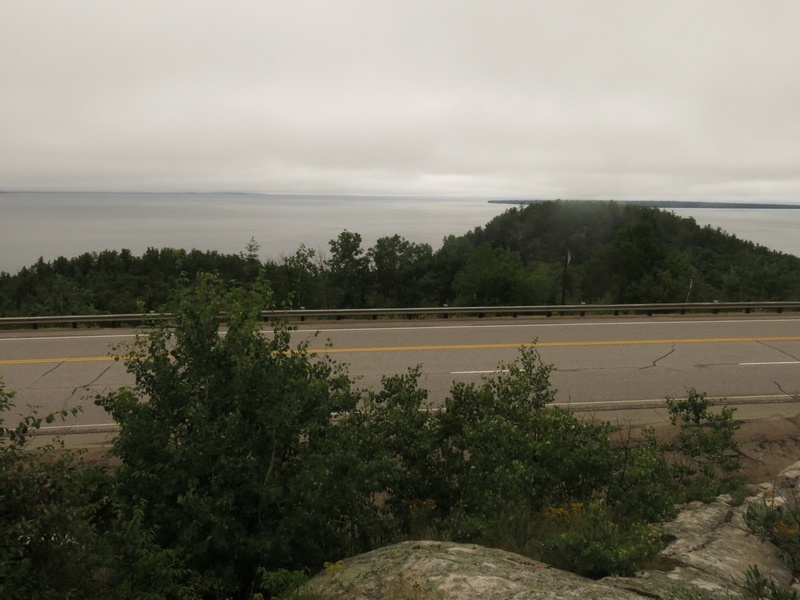 The ship made famous by Gordon Lightfoot, the Edmund Fitzgerald, sank not far from Pancake Bay. As the sun started to go down it cooled off fairly quickly so it was another early night in the tent.